For the wonderful news from the Kielder team is that two weeks after the Nest 1A pair, YA and Mrs YA, returned to the Kielder nest, they produced their first egg on Sunday 14 April at 4:30pm. This news is near perfect timing with Osprey Watch launching at Kielder this weekend running every Saturday, Sunday and Monday between 10:30am - 5:00pm behind the Boat Inn Kielder. Osprey Watch is a great way to find out more about this wonderful bird and is delivered almost entirely by volunteers. Prior to the return of ospreys, Forestry England worked tirelessly in the forest to enable live streaming from the osprey nest cameras and successful nesting. A new communications mast has been installed to ensure robust connection. 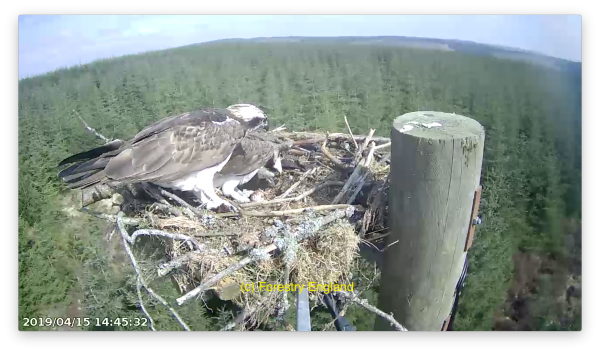 Nests 1A and 6 now have live streaming, whilst nests 2, 3 and 4 now recordings uploaded for osprey lovers to view at the osprey blog at kielderospreys.wordpress.com. You can watch the live feed of the osprey nests in Kielder Castle café whilst enjoying a hot drink and homemade food. To find out more visit visitkielder.com. To post osprey sightings visit facebook.com/kielder or twitter.com/visitkielder. Breeding pairs of ospreys have nested in Kielder between March and September since 2009, with activity on the nest tending to be mainly throughout May to August as the chicks hatch, are fed and then learn to fly and practice hunting. The Kielder Osprey Project is a partnership between Kielder Water & Forest Park Development Trust, Forestry England, Northumberland Wildlife Trust, Northumbrian Water and Calvert Trust Kielder.